We are introduced to John the Baptizer in Luke 1:5-24, as an angel comes to an aging priest named Zechariah. 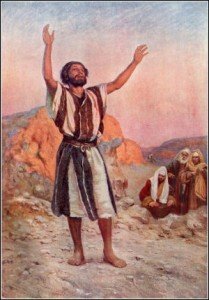 Zechariah is on duty in Jerusalem and is in the Priests Court in the Temple performing his assigned duty of burning incense to the Lord and praying to God that He would send the “Chosen One” (Messiah) that God had been promising. The angel tells Zechariah that his old wife will give birth to a son and they are to call him John and that he will be filled with the Holy Spirit from birth. The angel also says that he will bring many people back to the God of Israel. Verse 17 says, “And he will go on before the Lord, in the spirit and power of Elijah…. to make ready a people prepared for the Lord. Luke 1:80 says that John the Baptist grew and became strong in the Spirit and he lived in the desert until he appeared publicly to Israel. Matthew 3:4 tells us that John’s clothes were made of camel hair and he had a leather belt around his waist. His food was locusts and honey. Now, let’s take a look at Elijah from the Hebrew Testament. He shows up from nowhere, out of the desert, in 1 Kings Chapter 17 to begin his prophetic ministry. His name means, “The Lord is God”. In 2 Kings 1:8, we learn that he wore a camel’s hair garment with a leather belt around his waist. He has a very powerful and important impact on Jewish history. He spent most of his time in the desert around the Jordan River and is finally whisked up to heaven without dying. Why would John choose these locations to baptize? If you will look at a map of Elijah’s travels and stories, you will see that these are the exact locations where Elijah is fed by ravens, where he passes his cloak to Elisha and where he is taken up to heaven! John the Baptizer is operating in Elijah country! He is baptizing in Elijah places! He wears what Elijah wears! He wants to be like Elijah! How else could you more clearly say, “I am Elijah?” He is living out the prophecy that the angel had spoken over him before his birth. Don’t you know that his parents told him what he was supposed to be like as he grew up! He was doing his best to fulfill the destiny that God had given him. And, according to Jesus himself, John the Baptist was Elijah! Read Matthew 11:1-14 (esp. 14), and 17:10-13, where Jesus says that John was the fulfillment of Elijah and the Old Testament prophecy in Malachi 4:5-6. That prophecy said that Elijah would come back and prepare the way for the coming of the promised Messiah. John the Baptizer fulfilled that role, in that he came in the spirit and power of Elijah, and prepared the way for Jesus to come to the Jewish people. He accomplished that by trying to emulate Elijah in every way that he could, from his clothes to where he worked and even in his speech. John the Baptizer, like his predecessor Elijah, had a very important and powerful impact on Jewish history and was a key ingredient in God’s plan to send his son, Jesus, to be our Messiah!